Has the war between Directioners and the Kpop fandom gone too far? Recently, there has been a clash of fandoms between Directioners and the T-ara’s fandom, QUEEN’s and Kpop fandoms over a recent poll for the ‘Fan Army Face Off’ for the Billboard Awards. The war started off with Directioners accusing QUEEN’S for cheating in the polls as they had more votes than One Direction, and it was only an minor argument between rivals which took place on social media platforms such as Twitter and Instagram. But recently, the ‘war’ between the two fandoms have spiraled out of control, as fans from either fandoms have steered off topic, which is occurs more from the Directioners rather than the Kpop fandoms. They compared themselves to the Kpop fandom and considering their fandom more superior than the Kpop fandoms, they have harrassed T-ara’s Wikipedia page and hacking it to promote their band, they have brought in other bands that have had nothing to do with the voting results, such as the tragic incident of EunB and RiSe and posting offensive pictures with harsh descriptions too. They have also brought racism into their comments, as they are treating the word ‘Asian’ almost like a derogatory term. However, some Kpop fans have also been responding similarly by also posting offensive photos and bringing up ex-member of One Direction, Zayn Malik. 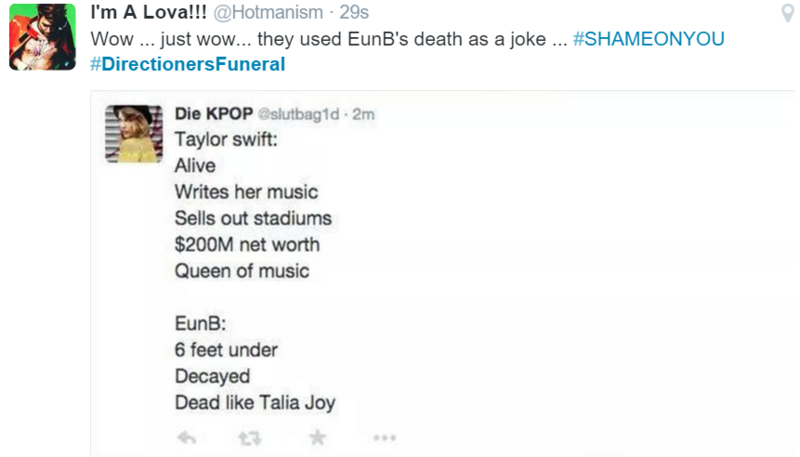 This ‘war’ has been tagged on social media as ‘#directionerfuneral’ and has been gaining massive amounts of attention, with passionate fans arguing back and forth. The tag was originally created by the Kpop fandoms, but the Directioners have taken it as a joke, and saying that they have ‘helped’ the Kpop fandom gain attention on the tag. What are your thoughts on the war between the two fandoms? Is it all just fun and games or could it turn into something even bigger than this? "1D fandom is so immature"